The holidays are supposed to be a time for joy and fun, for spending time with friends and family, taking trips, and enjoying all the best things in your life. Unfortunately, holidays are also a prime operating time for thieves. Whether it’s unguarded deliveries sitting on your doorstep or a house that’s empty for days or weeks at a time, holidays can offer plenty of tempting targets for would-be thieves. Many families travel to visit relatives over Thanksgiving and Christmas or take camping trips or family road trips around the Fourth of July, Memorial Day Weekend, and Labor Day Weekend. Since kids are out of school, mid-summer tends to be the most popular time for vacations, which often take place in July and average four to five days. 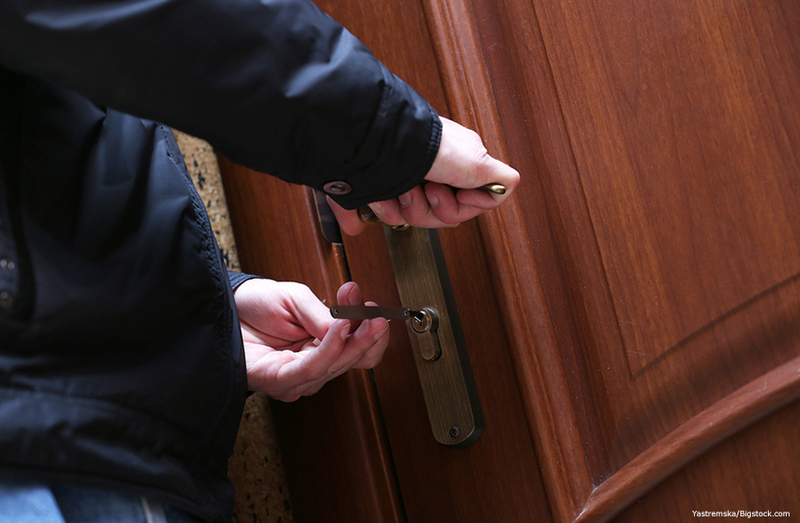 Thieves know that these are the times when houses are left empty and unguarded. In fact, they count on it. To make matters worse, there are plenty of things that many homeowners do when the holidays come around that have a negative impact on residential security and invite property loss. Fortunately, most of them are pretty easy to avoid, especially with a little help from residential alarm systems, security cameras, and other home security measures. (1) Deliveries tend to spike dramatically around Thanksgiving and Christmas—those Black Friday and Cyber Monday sales are pretty tempting, after all—and all those packages from FedEx, Amazon, USPS, and other retailers are tempting targets, especially when they’re just sitting on your doorstep. In fact, experts say that more than 20 million Americans had a delivered package stolen from their porches or front steps in the last year. While you can’t always control when a package gets delivered to your door, there are things that you can do to help guard against “porch pirates” swiping your stuff. External residential security cameras are becoming a popular option for homeowners to keep an eye not only on their property, but on who is coming and going and what they leave behind (or take with them). The Ring Doorbell system also lets you “answer” the door even when you’re not at home, which means that you’ll not only know when a delivery arrives, but you can help ensure that it gets placed somewhere safe. For a lower-tech option, many people choose to invest in something called a “bench box,” which looks like a simple front porch seating area but is, in fact, a self-locking compartment where package deliveries can be safely deposited. (2) When you unwrap your presents this year, don’t leave the cardboard boxes for big-ticket items like a new 65-inch 4K Ultra HD Smart LED TV out for the trash pickup. That just lets anyone who is driving by know exactly what you have in your house that’s worth stealing. Instead, try breaking packaging down in the garage and taking it straight to the nearest cardboard recycling bin. (3) You spent a lot of time decorating the tree, hanging lights, and otherwise making your home look festive and inviting for the holidays, so it only makes sense that you want to show it off. But leaving blinds and drapes open at all hours of the day and night is a window-shopping wonderland for would-be thieves, who can see more than just your seasonal décor. (4) Many of us also have family and friends coming in from out of town during the holidays, and so there’s a temptation to leave doors unlocked, stick a key under the welcome mat, leave the garage door up, or let your unlocked car sit in the driveway. While all of that may be a nice welcome for visitors, it’s also a pretty inviting “welcome” for thieves. Keep your doors locked, especially your car doors if your car has an automatic garage door opener, and you’ll help keep unwanted visitors from slipping in. Also, if you’re planning a holiday party and want to help keep an eye on what’s going on around your house, residential security cameras with NVR (network video recorder) playback can help you see what’s going on in real time. You can also view it the next day when you want to know who really broke that expensive lawn ornament. (5) Sure, we’ve all gotten used to keeping in touch with just about everyone and sharing all the everyday details of our life via Facebook. But in spite of the temptation, letting just anyone know that you’re off to Aruba for the holidays probably isn’t the best idea. If you are going to be posting about your vacation plans, check both your Facebook Privacy and Security settings and make sure that you’re not making public posts. Did you know that you can actually search Facebook for posts about topics like “going on vacation” and find posts from people you don’t even know, cross-referenced by city and date? So you can see why announcing your trip plans may not be the best idea. One person you should tell when you’re going to be away from home for a few days is a close friend or trusted neighbor who can help keep an eye on the place while you’re away. (6) As the weather outside gets frightful, we’re all more likely to crave a roaring fire in the fireplace or the warm, soft glow of candles to chase away the long, dark winter nights. That’s all very cozy, but it can also be a fire hazard. It’s also dangerous the leave holiday lights on all night or while you’re away from the house. (7) This doesn’t mean that you shouldn’t enjoy a crackling fire or some cheerful lights this holiday season; just make sure that you put fires and candles out and shut lights off when they’re unattended. While you’re at it, don’t forget to (8) check your smoke detectors and replace any batteries that may need it. (10) Also, don’t forget to set your residential alarm systems before you leave, even if you’re just going out for the evening. That’s especially important during the holiday season, since it’s the best season for thieves, and not just because the winter nights are so long and dark. (11) Okay, yeah, we said that going dark was a good way to let thieves know that you’re not around, but nothing says “we’re totally not home” like a mailbox stuffed full of a week’s worth of mail or newspapers all over the driveway. Sure, you could ask a neighbor to pick up the mail and the newspapers, but it’s better to put a USPS Hold Mail Service request in before you leave. Do the same with newspapers and temporarily stop your subscriptions. (12) What you should have a trusted neighbor do is keep an eye out for door hangers and whatnot and bring them inside. You’ll do the same for them because a vigilant neighborhood is a safe neighborhood. All the things we talked about above are common mistakes that many homeowners make around the holiday season or when they’re going on vacation, but they’re also mistakes that are easy to avoid. Keep an eye out for any of these behaviors, and don’t let them ruin your holiday or devastate your summer vacation. It’s easy to take a few extra precautions to be vigilant and protect your home, and it’s easy to add an additional layer of peace of mind with residential security systems from A-TEC. Want to learn more about how residential security systems and 24/7 monitoring can help protect your home, family, and property during holidays, the vacation season, and all year round? A-TEC Residential Security in Kansas City installs home security solutions for every need, including residential home security cameras, Ring Doorbell technology, and lots more. For more information on commercial and residential security, contact A-TEC Security today.